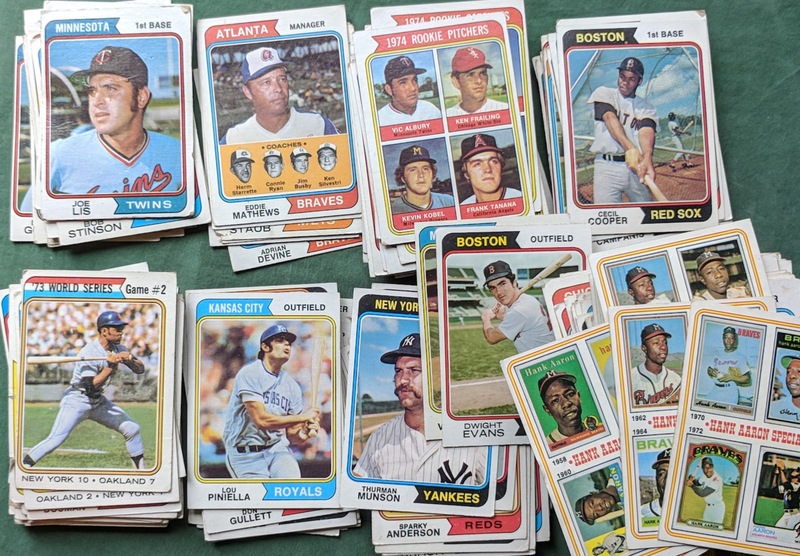 At last weekend's card show, I didn't return home with just the stack of vintage cards I bought, but also got a nice box given to me by my bud Rod from the blog Padrographs. I had a card for him, plus stuff that gcrl and Fuji had sent me to give to Rod the next time I saw him, but I definitely got the better end of the deal. With Rod being the king of Padres autographs, it shouldn't come as a surprise that he has some extras to throw my way. 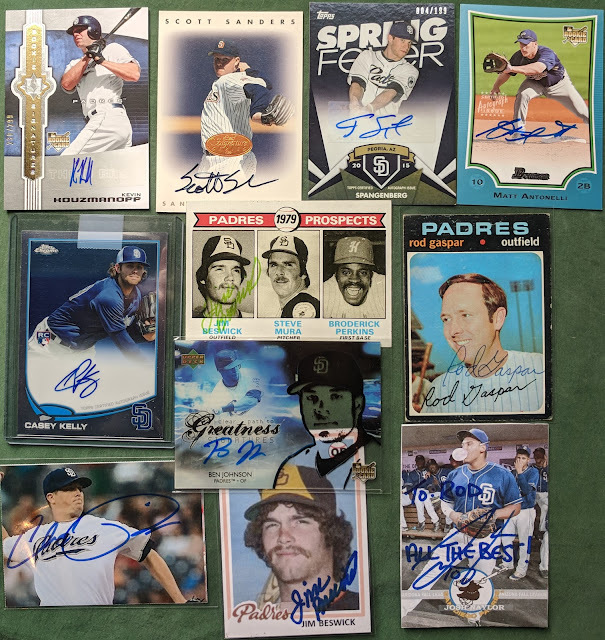 Some fun ones here, including fan favorite Kevin Kouzmanoff, current Friar Cory Spangenberg, and hot prospect Josh Naylor. 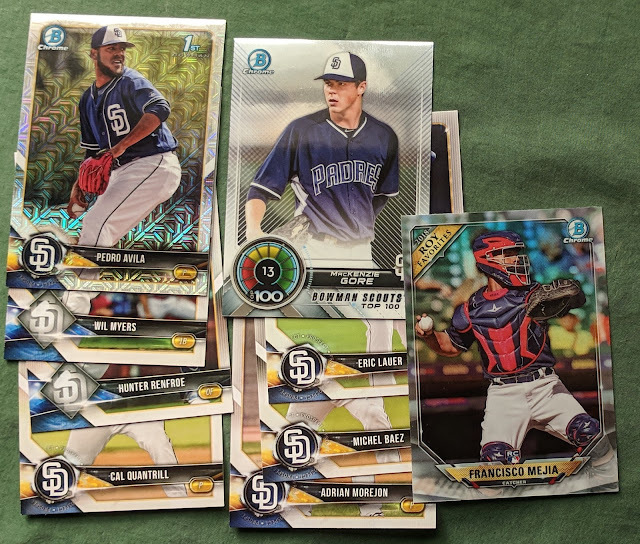 And of course there were plenty of neat Padres non-signed cards in the box, including a new Ozzie rookie reprint and some parallels. I've never had much of 1999 Topps Stadium Club, so this lot was cool to check out. 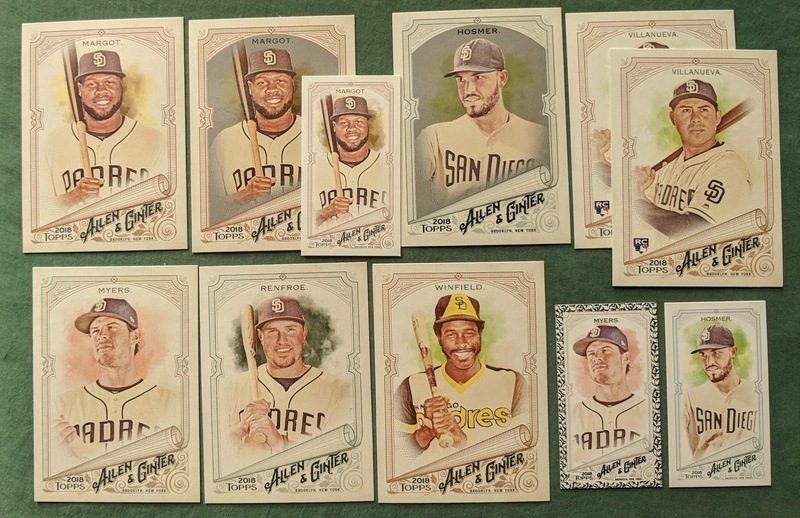 Nice lot of 2018 Bowman. Other than the blaster I picked up a while back (and some glowing minis I haven't gotten around to posting about), I haven't gotten in much 2018 Ginter yet, so these were appreciated. 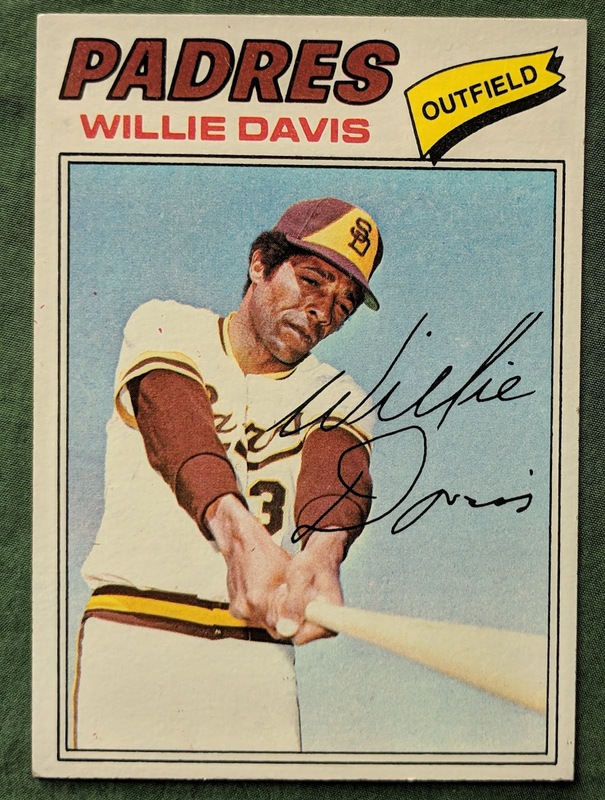 I thought this sharp looking Willie Davis might be put toward my future setbuild of 1977 Topps, but nope, it's actually a blank back, so it'll instead go with my Padres miscellany. But the 70s vintage is just warming up. 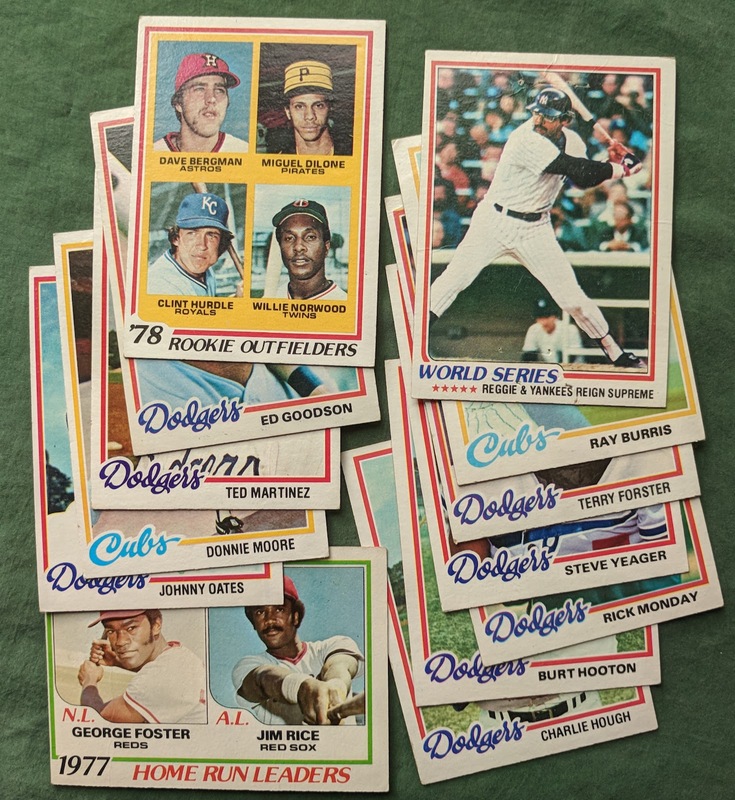 And a bunch of additions to my 1978 Topps set! I haven't done the math on it, but I think I'm somewhere around halfway complete. Oh man! It had been nearly a year since I last updated my 1973 Topps spreadsheet (previous update: 10/25/2017), and while I've technically completed the set, I would like to upgrade many of the lower-condition cards I've got in it. Rod took the time to go through my list and helped me upgrade 30+ cards.. very appreciated! But the majority of the cards in the box was a terrific starter lot of 1974 Topps, a set I plan to focus on one of these days after I finish some of my other in-progress builds. Probably about half the set here, including some notable cards such as Willie Mays' swansong. 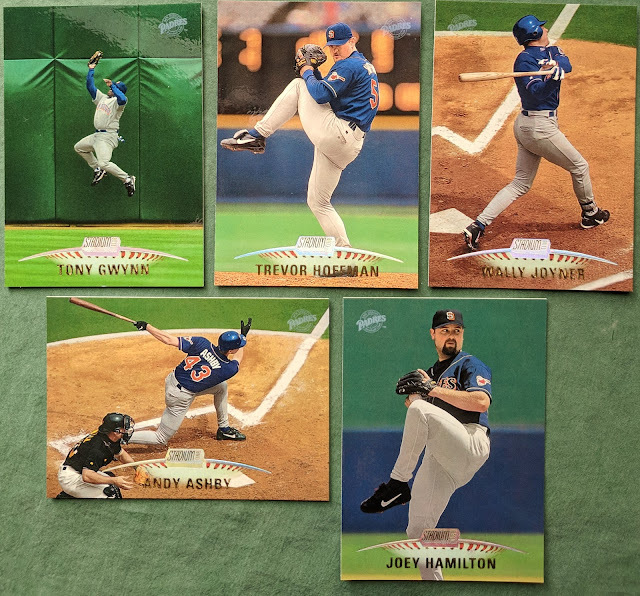 Rod was kind enough to also include a duplicate Hank Aaron special #4, the last card from that subset I was missing in my Hammer PC, so now I've got one for the PC and one for the set. Big thanks for the box, Rod! 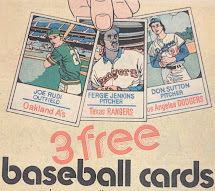 I'll dig up some cards for you to try to return the favor. Rod def. hooked you up with that box. BTW, if you ever want to move the Antonelli I'd love a shot at it. Dang. That's an awesome box! 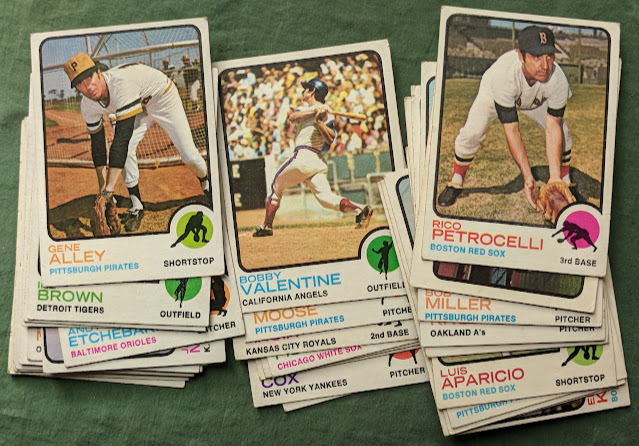 By the way... that 73T Valentine is frickin' awesome! 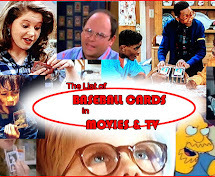 I recognize some of those cards! Ha. 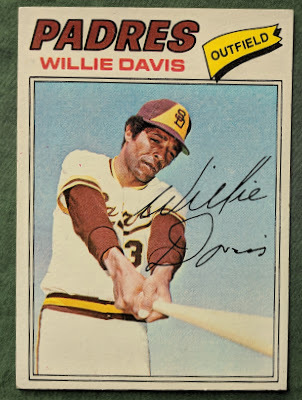 I need to find a copy of that Ozzie. I wonder how many times it's been reprinted at this point. 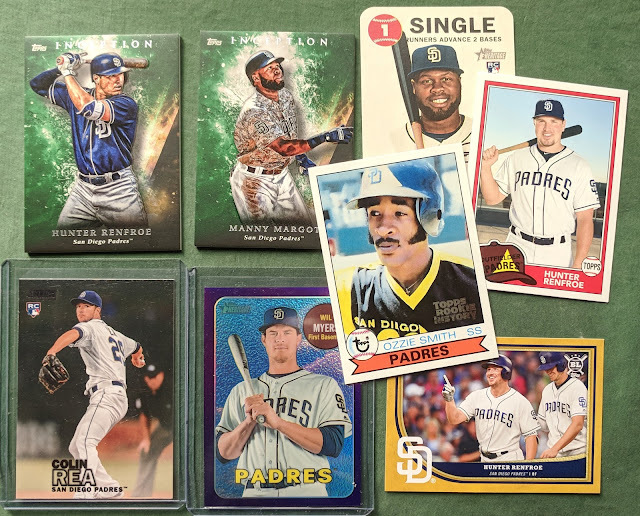 Great post and excellent cards. I love seeing a card of Tony Gwynn on defense with such a great photo.